This month, our engineer remixes a Pink Floyd-inspired track, and in the process shows that there's still a place for old-school rock production techniques! SOS reader Bill Chudziak requested our help on his track 'Children Of No-one', as he felt his own mix had too much of a forward, modern sound. He was after something more homogenous, though he didn't want the individual instruments to become lost or buried. He cited Pink Floyd as an influence, and on a first listen this was very evident in the atmospheric introduction, which includes a heavy nod in the direction of David Gilmour's guitar style and sound. Where the drums kicked in, though, I felt the guitar sound was more Richie Blackmore than Gilmour, and in places the vocals were reminiscent of Jethro Tull's Ian Anderson. 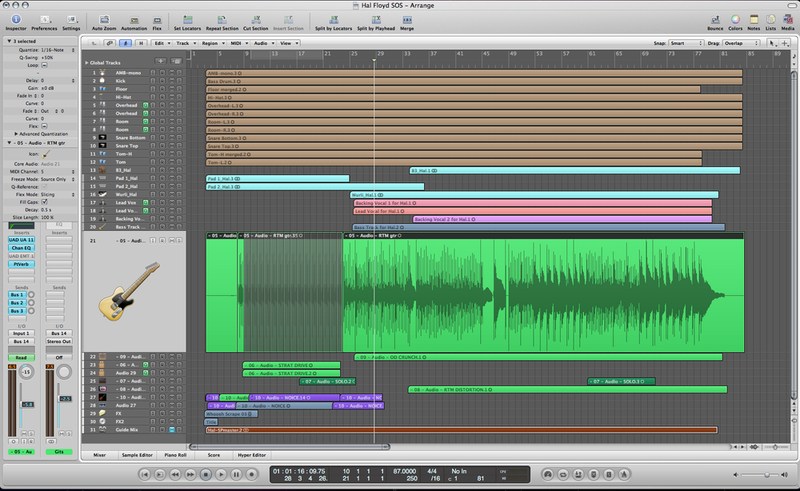 The full Logic arrange page of this month's Mix Rescue project. Bill's original mix was a pleasant surprise, as it was already rather good, but I felt that the song needed more of a classic rock sound. That could mean taming any over-aggressive edginess, and working to make the individual elements gel in a way that still left a sense of clarity to the mix. This might sound easy, but as today's rock styles tend to feature the drums much more prominently than they did back in the '70s — which is where this song clearly has its stylistic roots — it can actually be quite tricky. Everything, other than possibly the keyboard parts, had been played on 'real' instruments and recorded using real microphones. The drum kit came as a set of untreated files, with separate tracks for each drum (top and bottom for the snare), overheads, mono ambience and stereo room mics. The main instruments in the mix were electric guitars, bass and, after the drums kick in around a third of the way through the song, some electric organ, played and recorded through a rotary speaker, and a Clav-like Wurlitzer line. Before doing any real work on the mix, I spend an hour or so on the preparatory housekeeping tasks that I knew would make the job of mixing much easier: things like trimming away 'silent' sections that weren't actually silent, and manually silencing the tom tracks between hits, as while spill isn't always a problem, you always hear a lot of unwanted boom and ringing from the toms, as they vibrate in sympathy with the rest of the kit and other instruments. I applied a short fade after each tom hit, so that any spill from other drums heard during the tom decay would exit gracefully rather than simply cut off. All the drums were fed to their own stereo bus, and I set up dedicated buses for the main vocal (which had been double-tracked), the backing vocal and the guitars. I also added a parallel compression bus fed from an aux send in Logic and inserted a UAD Fatso emulation, set to 'Spank' mode and with its input gain cranked up to give the excessive degree of squash that I find parallel compression typically demands. I then proceeded to colour-code the various tracks and add some icons where I felt they were needed, just to make project navigation that bit quicker and easier when the mix was underway. 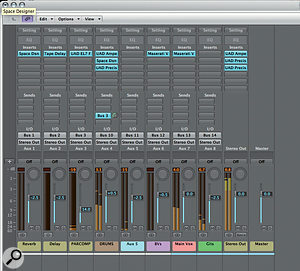 A little preparatory work can make the job of mixing easier. As well as pruning out unwanted sections of audio, and colouring channels for easy navigation, Paul set up many of the buses and effects that he felt would be appropriate to the track well before he started mixing in earnest. Knowing that the track was intended to build in energy towards the end, I started by setting up a rough balance of the various elements for the last verse and chorus, before going back to the intro to sort out the various layered sounds. That way, I knew I wouldn't run out of headroom later on, which can be a real problem when you need to build towards a crescendo having started your balance on a quieter part of the track. The intro employed a couple of atmospheric keyboard pads, one of which ended with some other-worldly clonking sounds, plus more atmospheric noise created using a guitar treated with copious amounts of delay and reverb. To add drama to this guitar atmosphere — which sounded more like an evolving pad than a guitar — I copied it and reversed the middle section of the copy, complete with long crossfades, panning the two parts left and right. My doctored copy was then processed through a flanger plug-in, with the mix control automated so that the distinctive flanger whoosh became audible just before the drum fill that introduced the main part of the song. I also sneaked in a wind-noise sound effect at the beginning of the track to give the intro a more positive start. Bill had been concerned that some of the keyboard layers were getting lost, so I added some rotary speaker to the main intro pad and then 'peaked up' its mid-range EQ, just to help it cut through. All these atmospheric layers were panned to give a sense of stereo spread and some auto panning was applied to the pad with the clunks at the end, to create a bit more movement. Playing over the top of this atmospheric bed was a repeated palm-damped chugging guitar phrase. This was played pretty consistently, and in many songs I'd have been happy to leave it as was, but in this case I wanted it to sound more hypnotic, and as the song had been recorded to a click, I found the best couple of bars then looped them, which did the job. Bill wanted to try a delay line on this riff, presumably to get a 'Run Like Hell' sort of feel, but the timing of the riff didn't really lend itself to this. Any tempo-sync'ed delay stayed behind the notes, making it almost inaudible, and changing the delay time simply upset the rhythm of the riff itself. In the end I decided to firm up this guitar part, which had a fairly clean sound, using a UAD 1176 plug-in compressor, and then applied a small amount (10 percent) of Early Reflection ambience from Logic's Platinumverb, with 124ms of pre-delay. Paul used level automation on various guitar parts, for example to add an accent to some 'chugging' guitar chords, just to help them interplay better with the vocal at those points in the song. The devil of so many mixes is in these sorts of details.This clean guitar track continued into the more rocky part of the song, where I automated the levels, both to bring out the accent chords between vocal phrases, and to allow a bit of building towards the end. This section, I felt, needed to sound tighter, so I used Logic's Flex-Time fuction in slicing mode to quantise this part to 16th notes, and did the same with the bass line. The original performances were pretty good, but this extra tightening helped produce a slicker feel. A doubled crunch-guitar track that came in during the louder section was also automated in similar places to pick out those accent chords. That left the slow and moody guitar intro part to work on. This was clearly very David Gilmour-influenced with some tasteful double-note bends. To get the kind of sound I guessed Bill was after (something like 'Shine On') I copied it onto a fresh track and performed my go-to fake-double-tracking trick, using a few tens of milliseconds of delay, then applying a chromatic pitch-correction plug-in with the pitch correction speed set just below halfway. I used Logic's Pitch Fix, but any automatic pitch corrector will suffice to introduce slight pitching variations necessary to create the double-tracking illusion. A tempo-sync'ed stereo delay set to 915ms and 345ms and with the highs rolled back to warm up the delays completed the treatment. At the end of the gentle guitar intro, a more 'classic rock' guitar sound made an appearance with some repeated hammer-ons, so I faded this up during the section where it overlapped the intro guitar and treated it with more delayed early reflections from Platinumverb to give it something of a stadium-rock feel but without adding conventional reverb. Level automation was also used to push it down for a few bars later in the track where the soloing overlapped with the main vocal. Often, the bass guitar needs a lot of treatment to make it sit in the mix but not in this case: the recording sounded nice and solid, and there was no obvious fret rattle. A little EQ boost (5dB at 360Hz) helped make the bass sound a little more 'radio friendly', and rolling off below 40Hz at 18dB/octave helped keep the lows sounding tight. A little compression from a Dbx 160 plug-in emulation added the necessary punch, helped by a touch of parallel compression. Paul used heavy filtering of the distorted guitar line which tracked the 'chug' rhythm part. This helped to avoid undesirable frequency clashes and masking, while still retaining the fundamental character of that part. After the drums kicked in, a more distorted 'crunch' guitar line mirroring the chuggy guitar parts also started up, and a little later in the song, another distorted rhythm guitar also joined in to help the song build. This could have made the mix sound a bit messy, so I limited the bandwidth of the distorted rhythm guitar at 250Hz and 3.7kHz using high and low-cut filters to constrict its range and to add focus. Also joining the ranks after the drums came in was an electric organ part treated with a Leslie-type rotary-speaker effect. To me it sounded too polite, and I wasn't convinced about the drawbar setting that had been used; my first instinct was just to use less of it in the mix, but then I figured it might work better if I could tailor the sound to make it usable at a higher level. 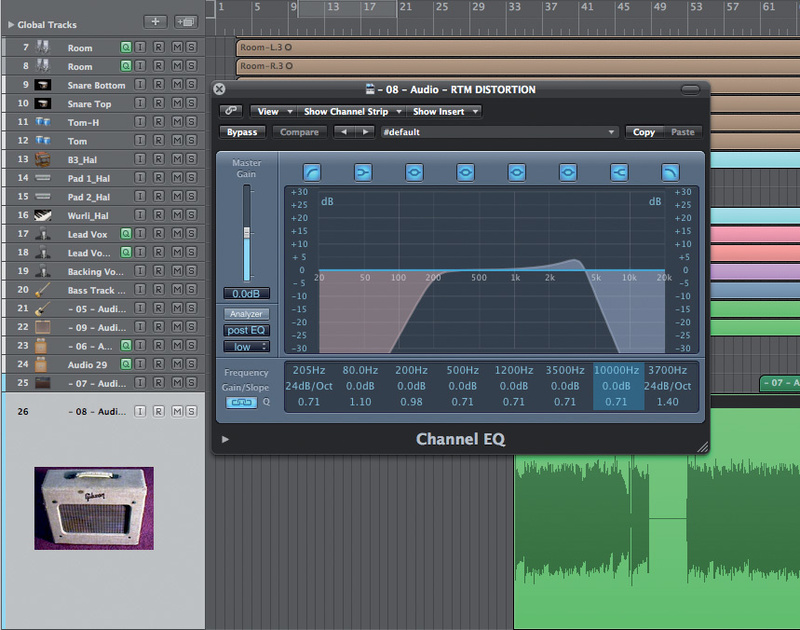 The solution was to add a touch more dirt courtesy of Logic's Distortion plug-in and then focus the sound by rolling off the lows at 240Hz and adding a strong, fairly wide peak at 5kHz. This did the trick and got much closer to what I felt was an appropriate rock organ sound with a cutting edge. The mix also included a very gritty, Clav-like electric piano sound that reinforced the guitars, so this was given some hard low cut with a 24dB/octave filter at 415Hz, which enabled it to be made more audible without muddying the mix. Even though the drums sounded good and had been well recorded, Paul found himself using a lot of processing on the kick drum to achieve the weight he felt the track demanded. All the drum parts had been well played and well recorded, but the kick needed a bit more 'weight' to make it work in this track. Rather than rely on EQ alone, I used Logic's SubBass plug-in to add more low end prior to EQing the resultant blended sound. The EQ was followed by an instance of SPL's Transient Designer, just to add a little more attack and to tighten the release time slightly. Lows below 30Hz were pulled down using EQ while a notch at 270Hz helped keep the lower mids from clouding up. A peak at 2250Hz added definition and, as some hits were noticeably louder than the rest, I used Logic's Limiter plug-in just to catch the occasional peak. The tom close mics worked fine without further processing, once the spaces between hits had been cleaned up, but I used a couple of tricks on the snare: the snare top-mic signal was treated using Early Reflections from yet another instance of Platinumverb, to add weight and grit, and on the bottom snare signal, I used a harmonic exciter to give it a bit more 'cut'. When mixed in at a high level, the room mics detracted from the focus of the overall kit sound, so I compressed these by 10dB using the UAD Fatso emulation, and rolled off the deep lows. Mixing a little of this back into the drum mix helped glue it together without getting in the way. The overheads made a far more useful contribution, requiring only a little cut at 172Hz, just to keep the mid-range clean, and a high-pass filter to roll off any unwanted extreme lows. A mono ambience track had also been provided, but as this didn't seem to do anything useful I left it turned off: don't be scared to exercise your mute tools and your pruning shears if it's what the mix requires! All the close mics were panned to try to match the drum position in the overhead mics but not panned too widely — I don't like the illusion of a 30-foot-wide drum kit! I routed all of the drum tracks to a stereo bus, and then applied just a couple of dB of compression, using the UAD Precision Bus Compressor set to a 2:1 ratio. An experimental application of UAD's Ampex tape-emulation plug-in also firmed up the drum sound to a useful degree, and I left that in there too. I placed a limiter at the end of chain again, set just to catch any loud hits that managed to sneak through. For drum reverb, I used a very subtle Drum Chamber IR loaded into Logic's Space Designer, applying this to the whole kit, and rolling off the reverb's low end below 200Hz. A send was fed from the drum bus to my parallel compressor bus (UAD Fatso emulation), as was a touch of the bass and some of the vocals. Used this way, I find that parallel compression helps provide the necessary sonic glue while also enhancing the overall sense of energy — yet, at the same time, it doesn't mess up the transient hits in the same way that conventional whole-signal compression can. 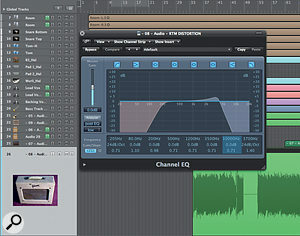 The double-tracked lead vocal was treated to some gentle pitch correction, more to enhance the double-tracking effect than to correct performance problems. Paul also used Waves' Vocal Rider to get the vocal levels in the right ball park — there's nothing wrong with 'cheating' like this if it does the job quickly and and to the desired standard! The main vocal had been recorded as a double-track, and very well too, I might add. I applied pitch correction to both parts, but I set this to a fairly slow correction rate, to enhance the double-tracking effect as much as to tighten the pitching. Different correction rates were used on the two tracks, to prevent the unpleasant phasing-like effects that can be audible when both are set to the same rate. The harmony vocal line was very well performed, and so needed no time-shifting to line it up with the main vocals, though a little gentle pitch correction was applied to further tighten it up. I used a 'cheat' on the main and backing vocals, levelling them using the Waves Vocal Rider plug-in — well, if it works, why not? 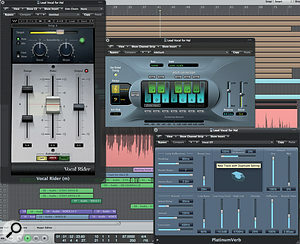 Then, compression and delay/reverb effects were added to both the main and backing vocal buses courtesy of a pair of Waves Maserati Vocal plug-ins. 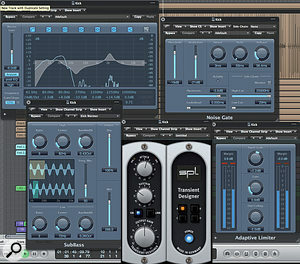 A slight 8kHz high-shelf boost was added to the first main vocal part, just to enhance its clarity a little. 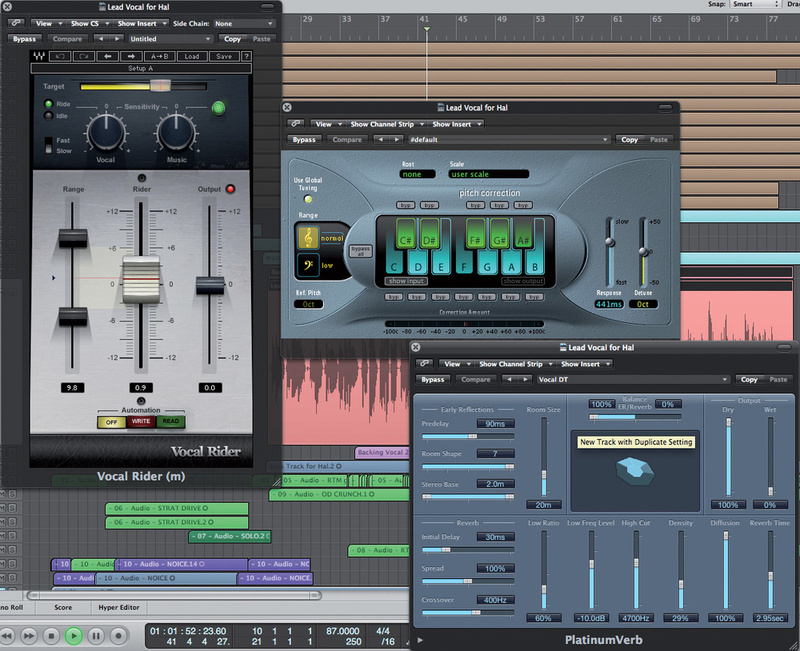 This worked well, but the vocals were already quite bright and edgy, so I later put an SPL De-esser plug-in into the main vocal bus, which helped tame the aggressive sibilants and consonants without dulling the overall sound. Had this track been destined for professional mastering, I probably wouldn't have applied any bus processing at all, but to create a plausible end result I put the whole mix through the UAD Ampex tape emulation (the default setting worked extremely well for this), which added an analogue fullness to the sound and kept the highs sounding sweet, then I applied a very light touch of compression courtesy of UA's UAD Precision Bus Compressor, with a gentle 2:1 ratio, and with the threshold adjusted to give only 2dB or so of 'squash' on the loud section. I used the UAD Precision Limiter at the end of the chain to catch any errant peaks, but not to do any really audible job: I don't think this took more than a couple of dB off the loudest hits. 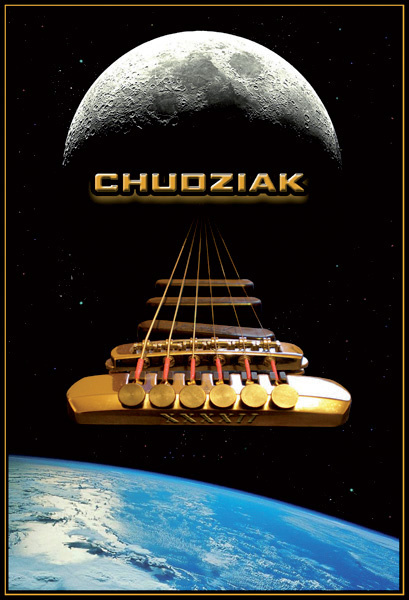 Remixed this month is 'Children Of No-one' by SOS reader Bill Chudziak, whose music and artwork tips a heavy nod in the direction of Pink Floyd. My approach to this mix combined my usual housekeeping chores and some core strategies, with other techniques adopted on the fly. I'll always start a mix by silencing spaces between sections, and by manually muting between hits in the tom tracks (you just have so much more control this way than when using a 'strip silence' function), and it's also pretty routine for me to use low-cut filtering to remove lows from any sounds that don't contribute to the 'legitimate' bass end of the track. 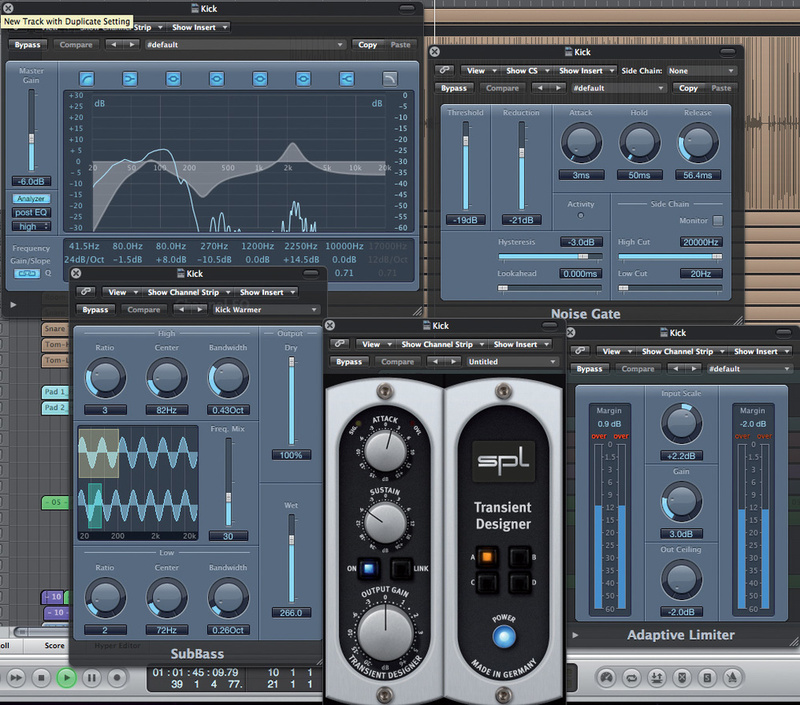 I'll generally also usually use either mix automation or something like Waves Vocal Rider (or a combination of the two) to even out the vocal parts before thinking about compression. Just remember that if using automation in this way, you need to use it before the compressor in the signal path, which might mean automating a gainer plug-in rather than the channel fader level. Once at this stage, there's a chance to get more creative using more assertive filtering, adding modulation effects, reversing sections and conjuring up treatments for the guitar and vocal lines. To me, the song changed in feel after the intro, so I tried to captialise on that contrast rather than trying to hide it by reducing the level of the layered textures and pads. This allowed the all-important guitar parts to soar over the backdrop, creating a more open soundscape than in the original mix. A pleasing side-effect of this is that the drum entry sounds more dramatic. Although the original mix was actually very good on a technical level, it felt to me that modern mix techniques were being applied, somewhat incongruously, to a classic rock track. I wanted to capture more of a vintage rock feel — and I think that with feedback on early mixes from Bill we achieved that in the end. If there's one lesson to take away from this mix, it's that once you get past a certain point, you just have to switch off the scientific part of your brain and simply go with what feels right. This month's track is 'Children Of No-one' by Bill Chudziak. Bill told us a bit about the recording sessions, and his original mix: "This song started out as something I created to develop my skills, and it really just grew from there. Along the way, I had help from both friends and professionals, and the end result is my original mix. 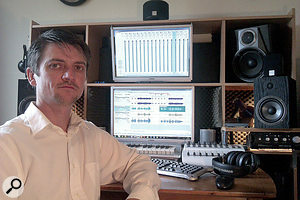 Originally, I created a demo, which I sent to Studio Pros, an online session-recording service. My demo was already fairly complete, so when I handed it over to the studio they had plenty to go on. Their producer helped me put together some production notes, and we agreed on some reference tracks — and from there it was a fairly straightforward process of laying down the tracks one after the other. "The first track you get back is the 'sketch', which is a basic layout for your song. When I first heard this I wasn't too sure about it, as the verse seemed a bit dull, and I suggested trying to bring in some more chord movement. Thankfully, though, I took the studio's advice when they said it was best to leave it 'as is', as this would help to make the chorus seem more powerful. After the sketch came the drums, bass, guitar, keyboards and vocals, in that order. Then it was passed over to their 'mixing desk', who brought it all together. The final stage of mastering saw the whole process completed in under a week. Along the way, I'd been able to ask for modifications, but I had trusted the studio thus far and knew their professionalism would shine through! "I'd hoped to be able to share the various recording techniques used for this song, but the studio guard their techniques along with the musicians' identity. What I can share, though, are the specific instructions I included in the production notes. Basically, I told them to do what it takes and 'play the song it ought and deserves to be'. As for the gear choice, I advised them to choose what the song needs and for the guitar effects, keyboard presets and so on to be experimental if required. I wanted to ensure the musicians had creative freedom, albeit within the outlines of my demo. 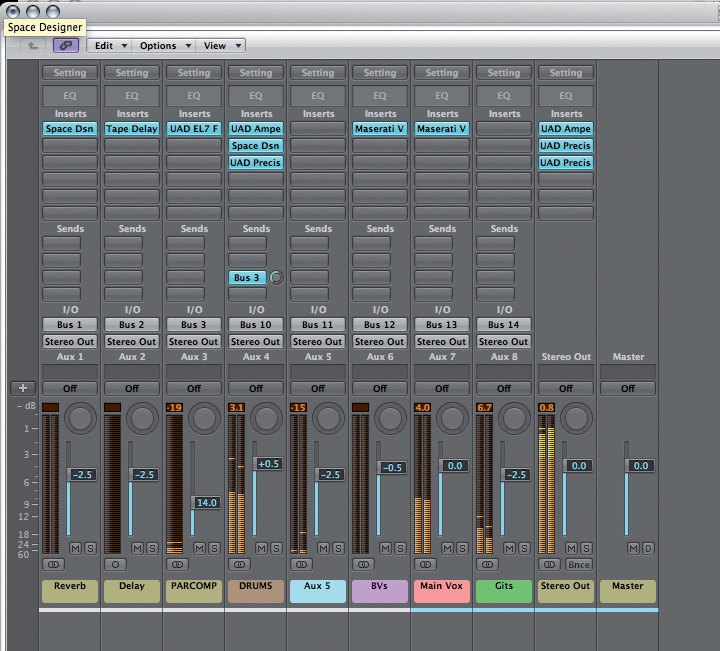 The full mixer, complete with all the plug-ins inserted on the various channels and buses on Paul's remix. Note just how little insert processing is applied to most tracks, and how much use is made of the send effects. The best way to learn from this Mix Rescue article is to hear the music Paul has written about, and you can find before and after examples on the SOS web site.